“Kala (Art) Kuwait” delegates visited the Indian Embassy and met H.E. Mr. Jeeva Sagar, the Ambassador of India, to Kuwait. The delegations and the H.E. Ambassador have exchanged different thoughts and subjects facing by the Indian Community in Kuwait and H.E. has highlighted his own views to diversify the activities of each associations in Kuwait which can be beneficial for the Indian community. The delegates briefed about the forthcoming event "Niram 2018”, Children’s Day Painting Competition on Friday, 9th November 2018 at Indian Community School Khaitan. This is the 14th Anniversary of NIRAM, being held on the occasion of Children’s Day, the birth day of Pandit Jawaharlal Nehru, the first Prime Minister of Independent India. The Painting Competition will be conducted in four different age groups. Parents also have the opportunity to win prizes for Open Canvas Painting. The online registration will be continued until 6th November 2018. For more details, please visit www.kalakuwait.net. 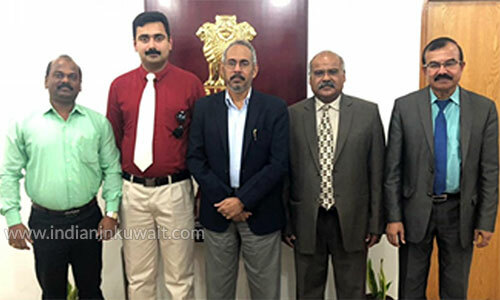 The Kala (Art) Kuwait delegations were consisting of Mr. Samkutty Thomas, President, Mr. Sunil Kumar, General Secretary, Mr. Jaison Joseph, Social & Cultural Secretary and Mr. Hassan Koya, Public Relation Secretary.